It’s no longer news that Anthony Joshua and Wladimir Klitschko put up a five star performance when the duo clashed in what has become a historic event, having 90,000 people parked in one stadium to watch the finest of a boxing bout in recent time. It was a show of two determined athletes who were ready to surpass the odds to become champions. Before this event the sport actually saw an upset when Tyson Fury out boxed the Ukrainian, the build up to that fight went from trash talking to comical display with Fury appearing in a press conference in a batman uniform or regalia. The Brit did something that really impressed me in that he did not accord Wladimir any form of respect, even on fight night the 6foot plus Fury complained about the ring canvass which was attended to. In all it was some form of entertainment stunt put up by him to upset the champion. Before now the two siblings Wlad and Vitali have controlled the heavyweight division and made history by becoming the only siblings in boxing to achieve such feet. The absence of formidable opponent meant that the siblings dictated what goes on in the heavyweight class for the period they reigned. They ensured that in the contracts they sign there is always a rematch clause and further still the opponent is meant to fight the other sibling just in case they lose the fight. For the period they were champions they took on anyone that came along and dispatched them with ease. Apart from the earlier days their career, the only fight that generated a lot of interest was the Wlad against David Haye, Haye lost that fight because of the height disadvantage from my own perspective and the referee should have deducted more points from Wlad from clinching and pushing down Haye regularly. It’s also important to note that Haye lost that fight partly because he underestimated the punching power of Wlad and he was duly punished. Vitali and Arreola also generated some heat vastly because Arreola was a promising American but particularly I had thought we would see an upset, yet with such an amazing ease Vitali proved the superior man on fight night. Meanwhile its worthy of note that during the reign of the Klitschkos they lived and still lives a private life style, aside boxing nothing was said about them aside the fact that they were erudite and both holds PHD in sports medicine and psychology. More so, their athletic and fitness level was never in doubt. They put in tremendous amount of work to stay in shape yet their dominance was far from what we were used to. From the Ali era, ( for me Ali was the master of mind game and trash talking expert) to the era when Larry Holmes came on board, to the point Mike Tyson showed up, the Lennox Lewis of this world, Evander Holyfield, Trevor Berbick, Michael Spinks up until the return of Big George Foreman, Michael Moorer and his trainer Tony Atlas, these individuals made the heavyweight thick with excitement, when a new champ arrives boxing fans and other sports fans will definitely know that something has changed. The Klitschko brothers literally killed the entertainment aspect of boxing, from where I stand I saw boxing going down because beyond been a heavyweight champion you also have on your shoulder the elite division of the sports. You sell the sport to the whole world. While they made the sport popular in Germany particularly the division suffered and the sports took a nose dive. At some point names like Manny Pacquaio, Floyd Mayweather, Oscar Delahoya , Ricky Hatton and the likes made boxing exciting and interesting to watch. The heavyweight division obviously needed a change of guard and thank God it came in at the right time with Fury doing the needful and Joshua doing the spectacular, boxing has been rescued and I am very optimistic that Joshua has the requisite experience to beat Wladimir for a second time for him to effectively cement his exciting arrival at the heavyweight. It’s obvious that partly the reason Wladimir lasted this long was because he never faced a big man who could move very well like Fury, and he has not fought an inexperience fighter who is physically strong and brave and is about same height with him. 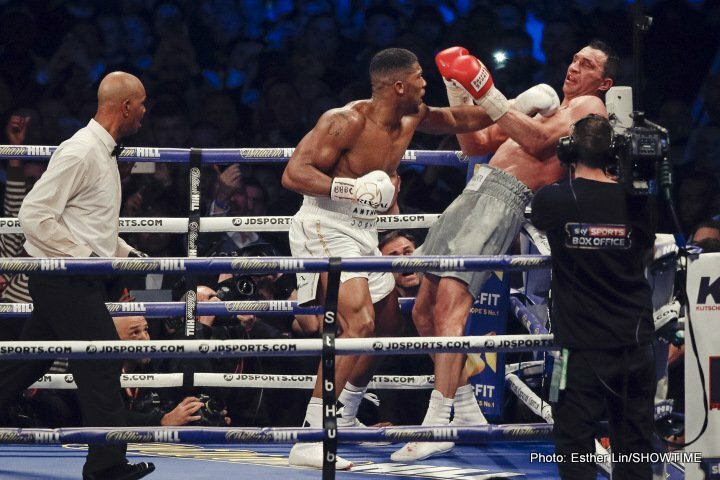 Summarily, the build up to AJ Klitschko bout lacked the usual trash talk associated with boxing generally, at some point I thought Wladimir was in his comfort zone but on fight night both men showed why they are at the top of the sport that excitement has returned to the heavyweight division. With Deontay Wilder still fighting mediocre opponent, Joseph Parker and Kubrat Pulev just doing the needful I think excitement has returned to heavyweight boxing and Great Britain is the new home of that excitement.